Precision Machining Technology is a two-semester, nine-month diploma program designed to quickly prepare students for the growing number of machining jobs available. 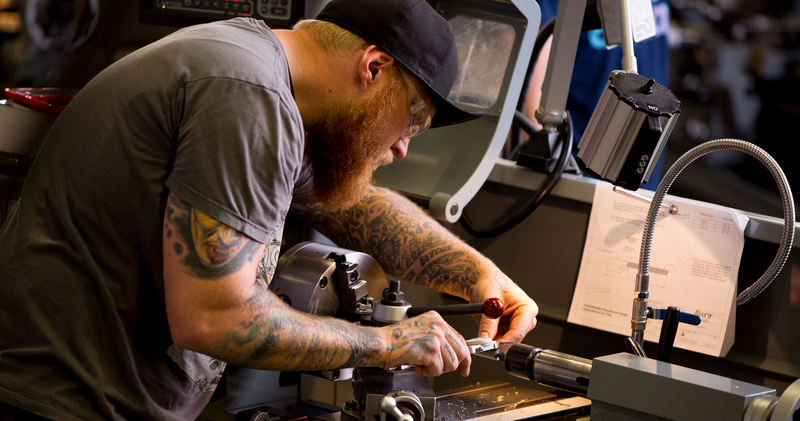 Are you interested in our Precision Machining Technology Degree Program? The Precision Machining Technology graduate will be able to set up and operate a variety of of machine tools to produce precision metal parts, instruments, and tools. Machinists use machine tools, such as lathers, milling machines, and grinders, to produce precision metal parts. Although they may produce large quantities of one part, precision machinists often produce small batches or one-of-a-kind items. The parts that machinists make range from simple bolts of steel or brass to titanium bone screws for orthopedic implants. Hydraulic parts, anti-lock brakes and automobile pistons are other widely known products that machinists make. Program graduates will be qualified to work in machine shops, factories, and other businesses that produce and repair machinery, parts, and related items. The Precision Machining field is a crucial one that allows graduates to be prepared to work in an ever chaning industry. You will enter the job field ready to use mechanical blueprints and instructions for machining projects, produce machined parts to given tolerances, and much more. Labor market information shows the demand for workers in the machining field is strong now and in the future. Through 2020, the number of machinists is expected to grow by 13.8 percent. And they earn an excellent living. Machinists in the Rapid City area earn an average hourly wage of $17.55.